Travelling is one of the best feelings in the world. You get to see new places, meet new people, try different food and even learn new things. As the famous saying goes “ If travelling was free, you’d never see me again”. More than cost however, taking the right things can be a big worry while travelling. Your entire requirements should be tucked inside one single luggage. So it’s a big decision as to what to carry and what to leave out. However, there are a lot of travel accessories that one should have while travelling. Listed below are some of them. 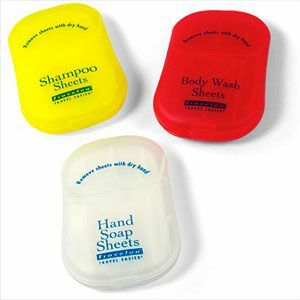 You no longer have to carry certain amount of soap and shampoo is small travel bottles. You can simply buy these sheets for $5 each. Just add water and you will be able to use them instantly. They also come in shaving, body wash and hand wash versions.